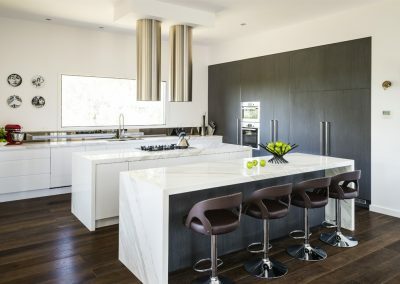 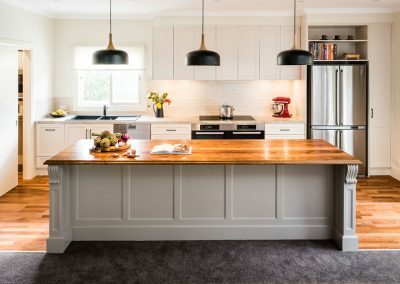 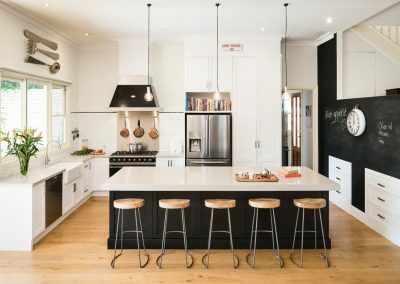 A finalist for the Best Kitchen $35,000–$60,000 category at the 2018 Furnishing Industry Association of Australia (FIAA) Industry Awards, this contemporary kitchen was expertly designed by Sue Bracy from Smith & Smith Kitchens. 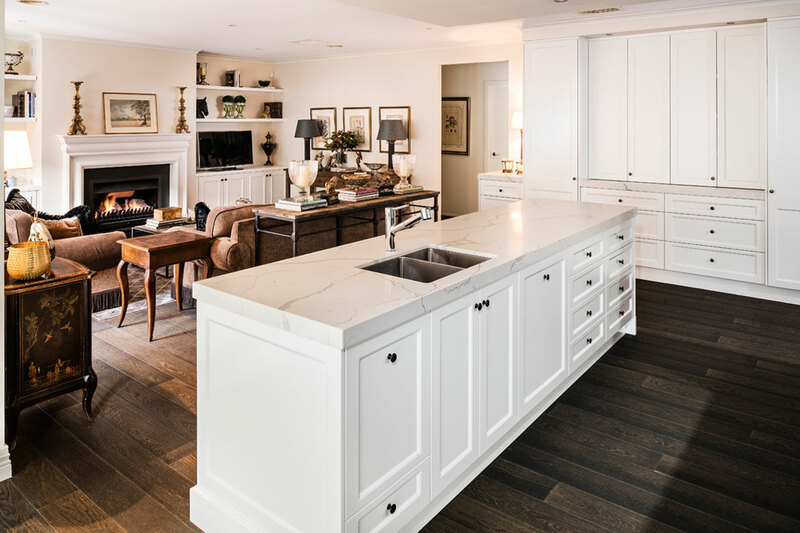 Showcasing a lavish island bench with a beautiful Calacatta Gold top from Lithostone, the space exudes elegance and charm. 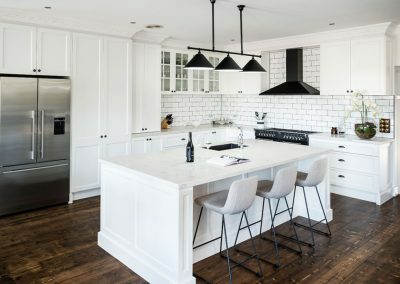 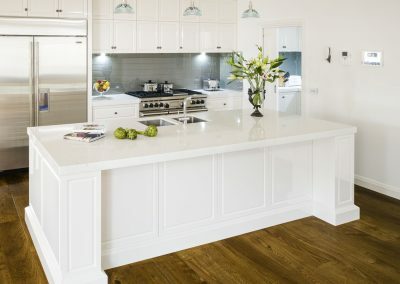 The island’s base features Dulux ‘Whisper White’ paint, which offers a striking contrast with the ‘Hardened Steel’ finish on the rear cabinetry. 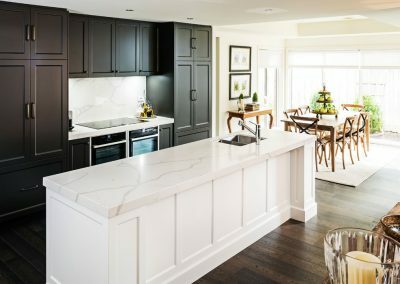 Showcasing Smith & Smith Kitchens’ two-pack flat-panel doors, the provincial-style cabinetry provides an abundance of storage space. 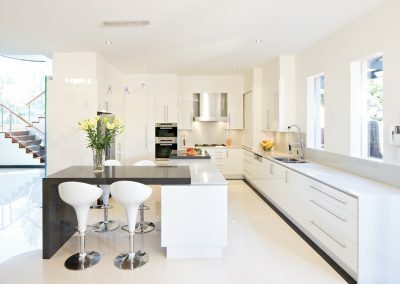 The highly functional cabinetry is fitted with Blum TANDEMBO X antaro soft-close mechanisms, drawer runners, and Hettich sliding and folding door systems for easy access. 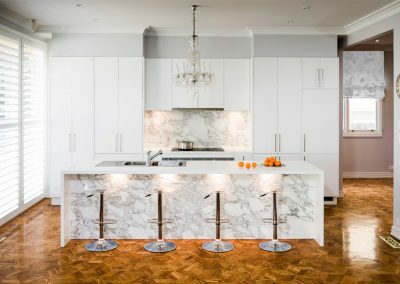 lluminated by dimmable LED lights, a 1.6-metre-wide pantry hides an abundance of storage space behind matching concertina doors. 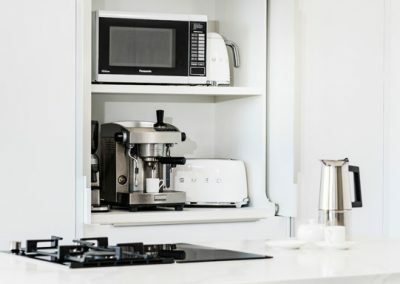 A separate appliance cabinet was also installed to ensure the kitchen remains free of clutter. 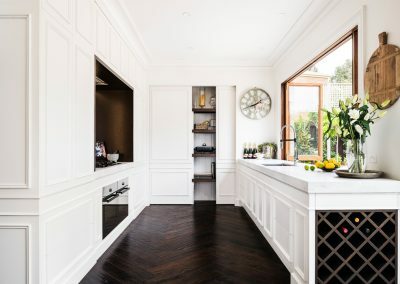 On the opposite side of the cabinetry wall, an integrated Fischer & Paykel French-door fridge achieves seamless visual appeal. 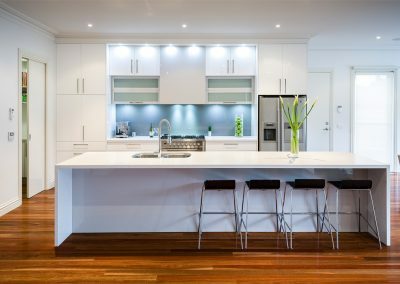 An undermount rangehood from Sirius Australia and a high-quality dishwasher are also completely concealed by cohesive profiled doors. 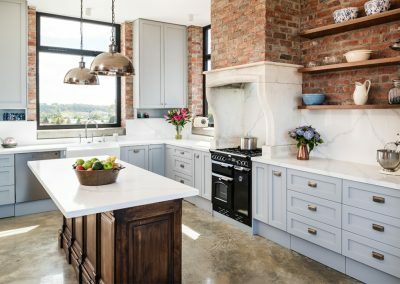 Two undermount ovens from NEFF and a flexi-induction cooktop are conveniently positioned between the floor-toceiling cabinetry for streamlined food preparation. 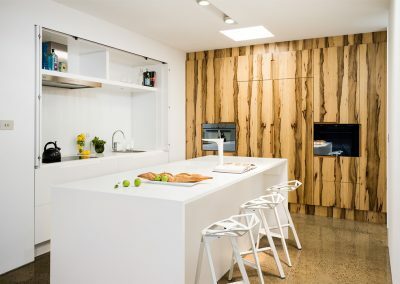 The rear benchtop and splashback feature the same material as the island to create balance in the space. 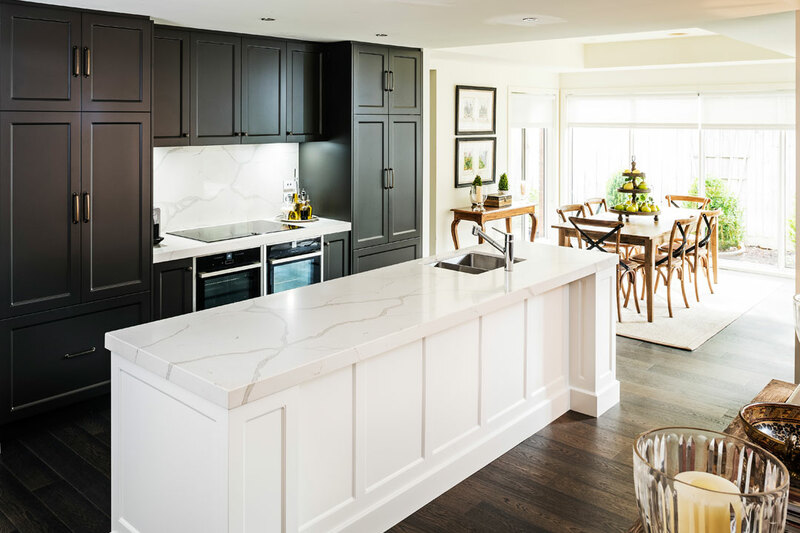 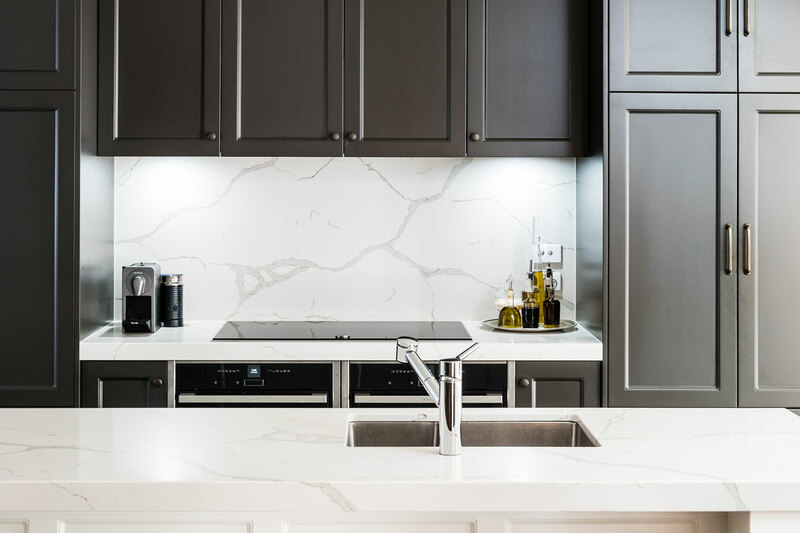 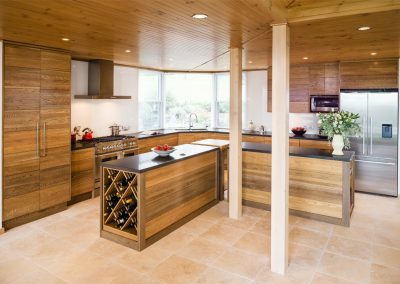 Established more than 30 years ago, Smith & Smith Kitchens takes pride in its ability to provide homeowners with beautiful cabinetry for all rooms of the home. 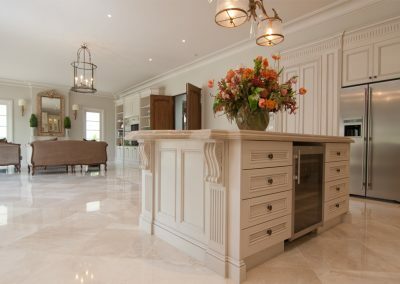 From kitchens and bathrooms to studies and libraries, there is no limit to the talented team’s abilities. 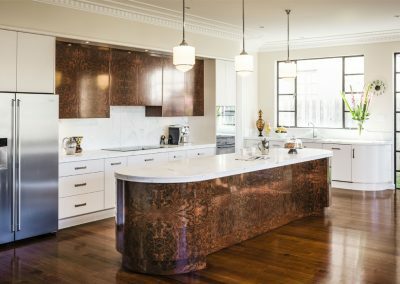 Smith & Smith Kitchens is comprised of designers, interior designers and architects, who service the Melbourne metropolitan area. 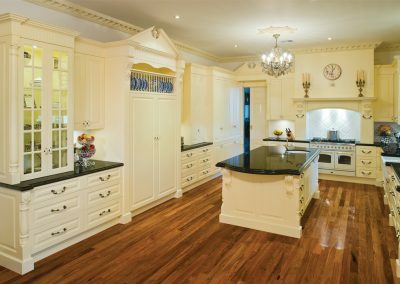 Known to unfailingly create exceptional spaces in any style, the company has proved itself as an industry leader time and time again.